Oxytetracycline 250 mg 168 tabl. 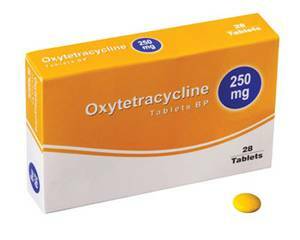 What is Oxytetracycline used for? Oxytetracycline is a type of medicine called a tetracycline antibiotic. It is a broad-spectrum antibiotic that is active against a wide variety of bacteria. Oxytetracycline is therefore used to treat a variety of commonly-occurring bacterial infections. Oxytetracycline is a prescription-only medicine. STDs such as chlamydia and gonorrhoea. Oxytetracycline is also commonly used to treat skin infections such as acne and rosacea (facial redness possibly accompanied by bumps, spots and small widened blood vessels visible near the surface of the skin). Oxytetracycline tablets should be swallowed whole with plenty of water. (Do not take with dairy products.) This medicine should be taken on an empty stomach one hour before or two hours after food. Always complete the entire course. Stopping early could cause the remaining bacteria to multiply in the body and the infection to return. Oxytetracycline is usually prescribed as a 7 to 14-day course. Specific conditions such as rosacea may require long-term treatment. Adults and children aged 12 and above: one to two 250-mg tablets every six hours for as long as the doctor prescribes. The treatment of rosacea and other conditions may require a different dose. Always follow the prescription exactly - never take more or less than the doctor recommends. Oxytetracycline is not suitable for children under the age of 12. Read the package leaflet before use. Increased sensitivity of the skin to UV light: avoid exposure to direct sunlight and sunbeds. If the side effects are severe or persistent, consult a doctor. For more information on possible side effects, see the package leaflet. You suffer from an autoimmune disease called SLE (Systemic Lupus Erythematosus). Consult a doctor on the use of Oxytetracycline if you have a health condition that is not listed above. Be sure to inform the doctor of any medicines you are taking. Oxytetracycline is known to interact with other medicines, including certain antacids and diabetes drugs. The doctor will have a list of medicines that you should avoid mixing it with and can provide you with detailed information. For more information, see the package leaflet. Do not use Oxytetracycline if you are pregnant or breastfeeding, unless otherwise advised by your doctor. This medicine does not interact with alcohol or affect your ability to drive safely.